A regular skin controls the interface that users see for online outputs. They are stored in the Skins folder of the Project Organizer. By default, the text in these skins is in English, and they are used not only for editing text but also to control the look of the skin in the output. See About Skins. On the other hand, a language skin can be used to display the interface in a specific language for online outputs. Language skins also control some text-based items, like cross-reference links. Language skins hold only text used for the output; they do not control the look of the output. To control that, you must also use a regular skin. Flare provides completed language skins for certain languages, such as French, German, and Spanish. 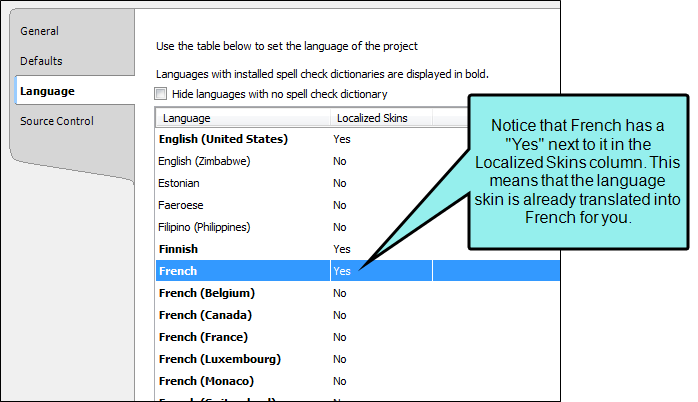 These are languages that are already identified as being "localized" skins when you select the project or target language (see Selecting a Language). For other languages, you can create language skins so that they can be applied to a project or target too (see Creating User-defined Language Skins). After you create a user-defined language skin, it too is identified as "localized." User-defined language skins are stored in the Advanced folder of the Project Organizer. Let's say you select French as the project language. 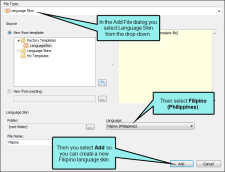 Now suppose that you want to use Filipino as the project language. Notice in the example above that Filipino does not have a "Yes" next to it. This means that you need to create a language skin for it from the Add File dialog (Project > New > Advanced > Add Language Skin). 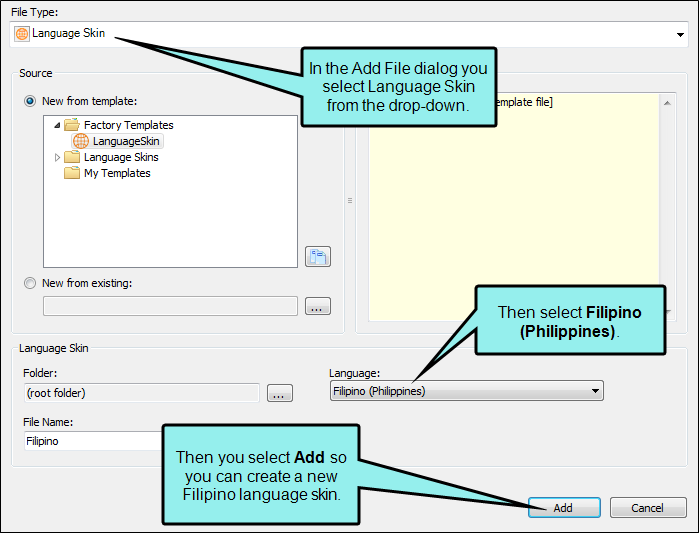 In the Add File dialog, you can select a language to use for your language skin. After you do this, the new language skin opens in the Language Skin Editor, which you can use to edit text labels and make other changes (see Editing Language Skins). After you are finished, you can select the language for the project or a specific target. When you do this, you'll notice that the language now has a "Yes" next to it in the Localized Skins column. Following are the basic steps involved with language skins. (Optional) Create If you are using a language for which Flare has already provided a completed language skin, you do not need to complete this step. However, if you want to use a language that does not have default translations, or if you want to edit the default translations, you can create a custom language skin. See Creating User-defined Language Skins. (Optional) Edit If you create a new user-defined language skin, you need to edit it to make sure it provides all the correct translations. You can also open a completed language skin to edit the translated text if you want. See Editing Language Skins. Note: If you want to make other changes to a skin to affect how it looks in the output, you can edit a regular skin in the Project Organizer (see Editing Skin Settings). Select You need to tell Flare which language you are working with so that it knows which skin to use in the output. This can be done when you are first creating the project. You can also change the language for the entire project later by using the Project Properties option. You can also override the project language and set it for the individual targets or topics. See Selecting a Language. Important: Creating multiple language skins for a single language is not recommended. 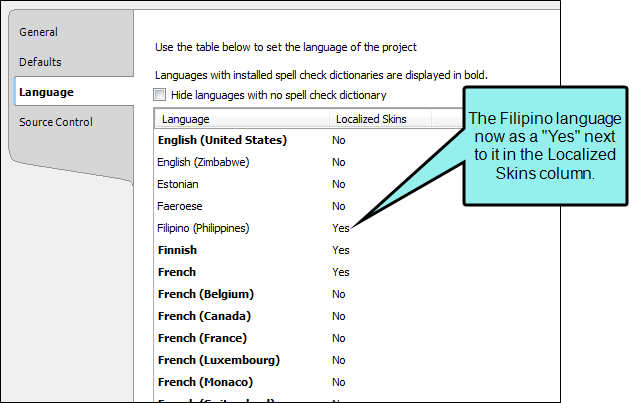 Flare applies the first language skin it finds for a language—alphabetically—in the Advanced folder of the Project Organizer. As a best practice, you should maintain all of your translations for a language in a single language skin to avoid confusion and incorrect translations. Important: Once you enable a language skin target, you should not disable it unless you do not plan to use it in your project. Disabling the language skin target removes any translated strings from your skin file. If you do not need to see a target in the editor, you should instead collapse the target. Note: Typically, language skins are designed for online outputs only (HTML5, WebHelp, and WebHelp Plus). However, if you are editing text strings in a language skin for toolbar items, those strings will be translated in Microsoft HTML Help output as well. In addition, the "Formats/Cross-Reference" items in the Language Skin Editor are used for both print-based and online outputs. Those items are intended to set text for context-sensitive cross-references. See Creating Context-sensitive Cross-References and Editing Text for Context-sensitive Cross-References. Another print-based feature controlled in the language skin is the heading text for auto-generated glossaries, indexes, and proxies. See Auto-generating Glossaries, Indexes, and TOCs for Print Outputs and Changing the Heading Text for Auto-generated Proxies. Language skins also control features found in MadCap Feedback, such as comment labels and profile items.